October | 2014 | Why a librarian? 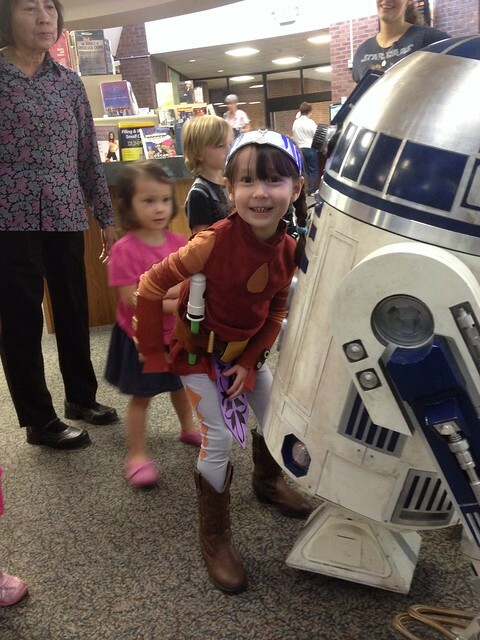 The official Star Wars Reads Day has come and gone for 2014, but hosting a Star Wars event at your library is always a sure-fire way to get tons of new visitors into your building. With unofficial days like May 4 (“May the 4th be with you”), the new Disney XD series “Rebels” on the small screen, and a new set of stories headed for the big screen in 2015, Star Wars’ popularity will not be going away any time soon. 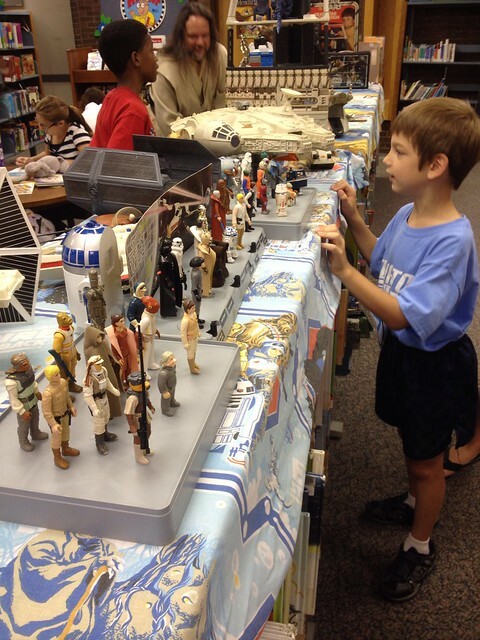 The great thing about a Star Wars event is that it is for all ages. You will see entire families and they will travel from all over if you can get the publicity out there in your library’s paper calendar or online social sites. 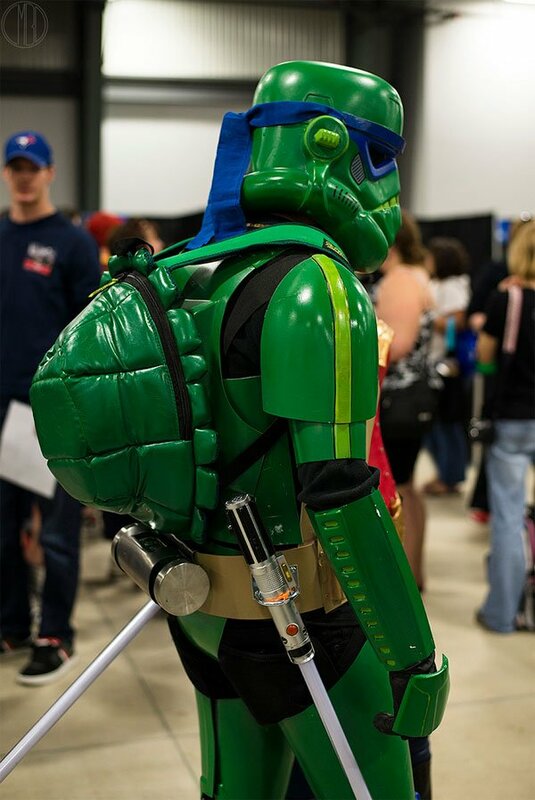 First things first – go to the 501st Legion’s website and find out if you have a local garrison. 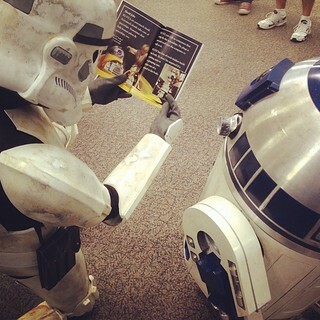 Star Wars programs are huge hits when you can have these amazing costumed fans wandering around. They do not charge for their services (though they have never said no to the boxes of donuts and coffee I leave for them in the back room). With this in mind, you obviously want to avoid the end of October (Halloween and New York Comic Con) and July (San Diego Comic Con) and it might be wise to check to see if there are any other major Star Wars events coming up (like Celebration Anaheim, a huge Star Wars convention sure to attract many of these fans away from home). Once you’ve found a date on your calendar, contact your local garrison and they will start looking for volunteers to help out. Because of how my library system works, I tend to contact them ASAP, sometimes six months in advance. This isn’t necessary but the more time they have to put it up on their forums, the more chance you have of getting a strong turnout. Another thing worth searching for is a local R2-D2 Builders Club. I know Maryland has a very active group and I’ve had their members stop by with amazing R2-D2s that thrilled everyone in the library. If you can connect with one of these awesome people, I highly recommend it. And one more random group to reach out to — collectors! I am a member of the DC Star Wars Collector’s Club and I was able to get one of our members to bring his collection into the library for the day. Club members have also donated items to be used for prizes. Teaming up with groups like these can add that extra special something to your program. Next, look at your space and thing about your community. If you have a meeting room and feel like it will be a small turn out, you could have it in there. But each year I have held the event, we have had over 100 people stop by, and our meeting room capacity is 160. I didn’t want to ruin anyone’s fun by citing the Fire Code, so we have always held the event in the Children’s area of the library proper. Yes, it’s loud and crazy but it means that everyone can have a good time and have plenty of space. And it gives the added bonus of people stumbling upon the event by chance and calling friends to visit. My program usually goes 2-3 hours, so plenty of time for people to show up. Also keep in mind that people will want to get photographs with any droids or costumers that are there so think of a spot that would work well as a staging area. You can direct the 501st members to that spot and have your patrons form a line. Now the part that you really need to plan out! Like I mentioned, you are going to have fans of ALL AGES attending your event. We’ve had everything from 30 – 300+ people so keep those crafts SIMPLE but fun. A sure fire hit (and a book tie-in!) 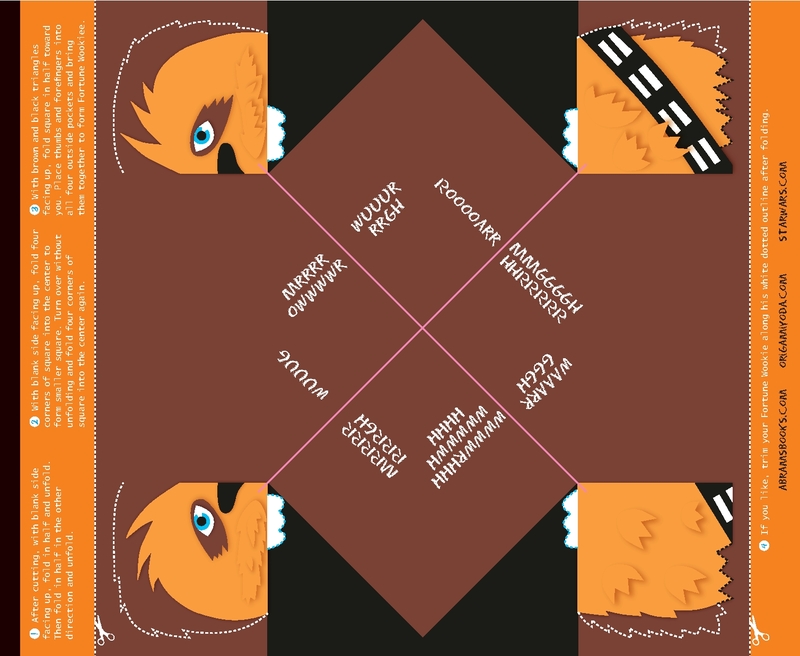 is Origami Yoda and the Fortune Wookiee. 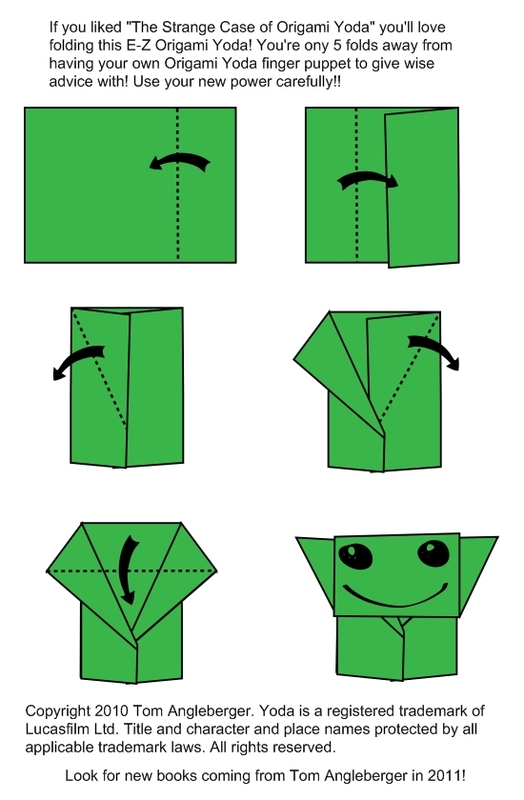 Author of The Strange Case of Origami Yoda Tom Angleberger uploaded instructions to his blog to help young folders: The Simple 5-Fold Yoda and the pattern for the Fortune Wookiee. (I do recommend doing a few practice ones yourself so you’re ready to help the kids if they get stuck). Another favorite (and easy) craft is to let the kids color a stormtrooper helmet, cut out the helmet, and then tape it to a stick, creating their own mask. When I set up for this craft, my instructional poster includes photos of different variations of Star Wars stormtrooper cosplayers, to highlight that they can be more than just white helmets. 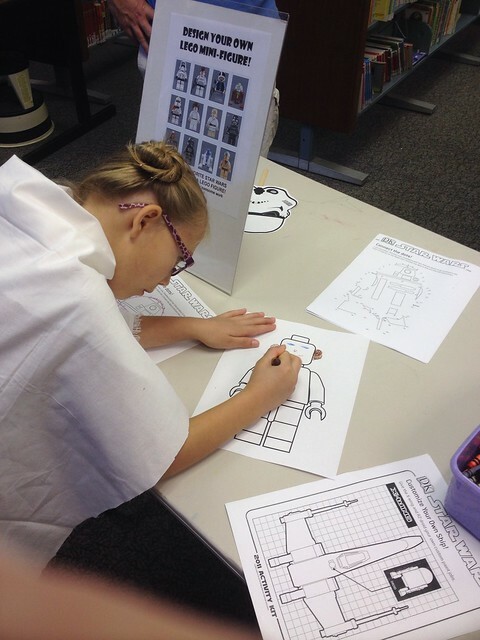 LEGO is always a hit with any age so the blank LEGO Minifigure coloring sheet works well here too. Again, when I make the poster with the instructions for the craft, I have a bunch of images of Star Wars Lego minifigures to help inspire. 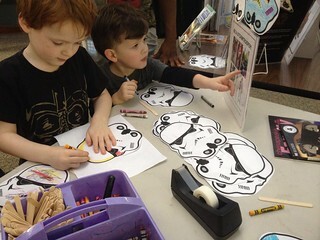 There are lots of activity and coloring sheets in the Star Wars Reads Day packet. If you do decide to take part in this event, definitely register for the email list so you can find out about publisher giveaways. Posters and stickers can make for great prizes. 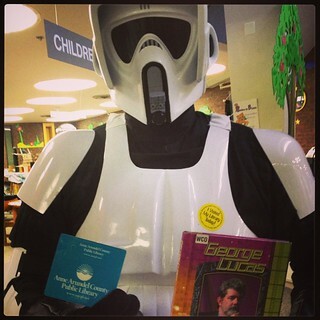 This year I did a scavenger hunt/raffle where the children had to follow hints around the library, finding a secret letter at each location to spell out the name of the planet where the Rebel base was located. I used these slips as a raffle for prizes, awarded the following week. I had the contestants write down their name, age, and phone number so I could be sure to pick out appropriate prizes. I also created a 10 question Trivia Challenge, also asking entrants for their name, age, and phone number. It had some tricky questions, but I had 5 people who managed to get most of them correct so they got nice prize packs as well – a mix of Star Wars items and library items. It makes for a very busy, non-stop few hours, but it is a whole lot of fun. I stay on my feet the entire time, checking on my special guests and checking on my patrons (and usually photocopying more of the crafts as things get low). Please feel free to comment if you have any questions about this program. It really is one of my favorite events (even if I pass out afterwards). Three of my favorite things came together in one post — getting paid to blog, Star Wars, and reading! This is the third Star Wars Reads Day event we have hosted and I am so looking forward to it! It’s always a huge family event. Preschool Early Literacy Storytime: DINOSAURS! Through some crazy random happenstance, I have somehow become an “early literacy specialist” and instead of doing 8 storytimes a year I’m doing them every week…forever. It’s been an interesting experience to say the least. Right now, having survived the first six months doing this, I am finally together enough to gather up old storytimes and modify them to fit the Early Literacy model. I recently updated my Dinosaurs storytime and it was a HUGE hit! I googled around and found lots of great suggestions for how to make the plan for EL friendly. This is one I will definitely come back to each year. This early literacy storytime is geared towards preschool aged children, ages 3-5 years old. If you drop a few of the books, you can easily modify this to be a toddler age program. I always open my programs with a clapping song I learned way back in my first storytime training “Clap Along With Me”. For added fun, I look for a puppet with “hands” and tell the children that my puppet’s soft hands don’t work for clapping and he needs their help! Works every time! After we finish that, I do a quick Open Shut Them to get the wiggles out of our fingers and then start the stories.